London (AP) — England needed a captain’s innings from Joe Root and he delivered on his first day in the job. Root hit a brilliant and tenacious 184 not out against South Africa on Thursday, leading his team out of deep trouble and to 357-5 at stumps on Day 1 of the opening test at Lord’s. Root’s 12th test century was invaluable, transforming a nightmarish start to his time as captain, when England were 76-4, to a promising one by stumps on the first day of the four-test series. He did, marshalling momentum-changing partnerships of 114 with Ben Stokes (56) and an unbroken 167 with Moeen Ali (61 not out) to put England in control after they were on the verge of a collapse. Root made the most of a number of let-offs: When he was on five, a top-edged hook dropped just over the head of the fine leg fielder. An outside edge flew through JP Duminy’s hands at gully when Root was on 16. And then on 149, Root was stumped off Keshav Maharaj but was called back for a no-ball. Vernon Philander snatched three first-session wickets for South Africa, but the early advantage for the tourists disappeared after lunch as Root’s first decision as captain — to bat after winning the toss — ultimately paid off. Root was the pivotal figure and England, struggling at 82-4 at lunch, added 100 runs for no wicket in the second session and 175 for the one wicket of Stokes in the last session. Walking out to the wicket in the sixth over with his team 17-2, records would not have been on Root’s mind. But by the end of the day, he had taken former skipper Alastair Cook’s record for the highest score by an England player in his first test as captain. Cook, one of Philander’s early wickets, applauded Root’s century with a grin as he watched from the balcony. Both teams were under new captains for the opening test, with Dean Elgar stepping in for South Africa while Faf du Plessis remained at home for the birth of his first child. Elgar was by far the happier captain at lunch, but had plenty to worry about by stumps, with Root and Ali showing no signs of letting up and Elgar also having to manage the fact that the Proteas have picked just three seamers for the game. 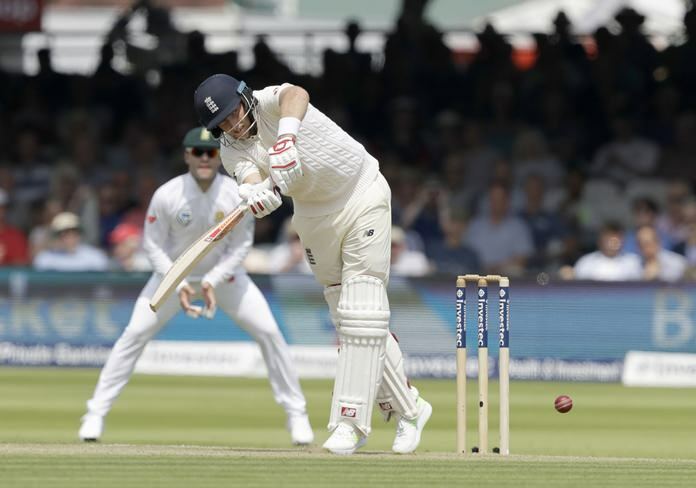 England attacked spinner Keshav Maharaj, who ended the day with 0-107, and the Proteas had to use part-timers Theunis de Bruyn and Temba Bavuma in stages to shore up their bowling. South Africa also bowled 13 no balls, two of which denied them wickets. Morne Morkel bowled Stokes for 44 but overstepped by a long way. Stokes added just 12 more runs, but Root’s reprieve off Maharaj’s no ball is likely to cost the tourists much more.